Smash-Up, the Story of a Woman (1947), also called A Woman Destroyed, is a drama film with elements of Film Noir, which tells the story of a rising nightclub.singer who marries another singer, whose career takes off, then falls into alcoholism after giving up her career for him. 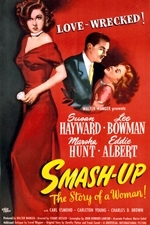 The film stars Susan Hayward, Lee Bowman, and Eddie Albert, and was written by Frank Cavett, John Howard Lawson, Dorothy Parker, and Lionel Wiggam, and was directed by Stuart Heisler. Ethel Wales appears in an uncredited part. The film was nominated for Academy Awards for Best Actress in a Leading Role (Susan Hayward) and Best Writing, Original Story. The story is loosely based on the life of Dixie Lee, the first wife of actor-singer Bing Crosby.